Mike’s American Grill is the Springfield outpost of the Great American Restaurant group. It’s a go-to pick for a consistent good time and great food and service. 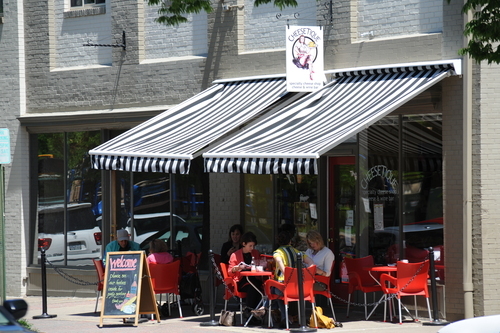 The South Austin Grill is a local tex-mex favorite on King Street in Old Town. Great music, hot chips with excellent salsa and a variety of serious Margaritas accompany the always top-quality food. Sometimes they have live music. The Bonefish Grill is located in the Kingstowne Town Centre. Ever since it opened it has attracted quite the crowd. The dining room is attractive and the seafood is very good. Often we ask for a piece of fish to be simply grilled rather than with one of the sauce choices and are always happy with the results. One of the fun things about Bonefish is the bar area. They have long community tables that are first come, first serve. Every time we go there we meet new people and get into some interesting and friendly conversations. They also have whatever sports game is happening on the tvs, so it gives patrons a choice—a table or booth in the dining room or the sociable bar area. Indigo Landing is a great place to grab a drink by the water and watch the sailboats from the marina and the planes land at National Airport. It also has the Capital and the Washington Monument in the background. There are tables and a fun bar inside, but we always seem to gravitate to the outside when it’s good weather. The deck is huge with regular tables and available bar stools for the side area. Indigo Landing is also a convenient place to meet for a drink before going somewhere else, whether dinner, a game or a show. Rustico is on Slaters Ln. between Rt 1 and the GW Parkway. They have a really extensive beer menu, wonderful pizza and a great local atmosphere. For those of you into Belgium beers, you’ll be in heaven. It’s got a cool décor going and tvs for those watching whatever game is happening. There are lounge areas with a fireplace, dining area and community tables in the bar. The scallops and the pork chop are also outstanding. There are tables outside which are very popular on nice nights. The Thai Café in Springfield is one of my favorite local places. The owners, Penny and Tony have always had great authentic food along with a friendly staff that is quick to get whatever you want to have. This unassuming place in one of the out buildings at Springfield Mall always surprises those who come for the first time. From the traditional lemongrass soup with shrimp to the drunken noodles and the southern-style curries, there’s not a bad dish at the Thai Café. Those of us lucky enough to have been to Thailand appreciate this place. Of course a lot of folks do carry-out too. Los Tios restaurant on Mt Vernon avenue in Del Ray is a very popular tex-mex spot. Their margaritas are powerful and tasty and the atmosphere is easy-going with a lot of locals there. They have a regular size margarita and a large. The large is quite hefty. The food is more authentic than a lot of places. Ray and Cindy like the fajitas and taquitos and say the chips are thin and light. They have a patio available for eating outside in nice weather. We’ve gotten lucky and parked right across the street several times. The Chart House is located on the water right behind the Torpedo Factory in Old Town Alexandria. During the nice times of the year they have an outdoor deck area where they serve dinner and drinks. It’s cool spot because of the action on the water and the new Woodrow Wilson bridge in the background. If you sit inside, make sure you get a table with a water view. The Chart House has an upscale menu featuring a lot of good fish choices and a great salad bar. It gets packed on the weekends, but with our job we often go late and it’s easier to get a table. I’m partial to their Mai Tais. There are usually street performers in the outdoor square by the Torpedo Factory. Pane e Vino is an Italian restaurant at the Lorton Station Town Center. We went for a late lunch last Friday. It was a good time. We sat outside right by the fountain. We ended up splitting a pizza which has 4 different quadrants. One was artichokes, the second was sausage, the third mushrooms, and the last one was ham. Each of the different kinds had 2 slices, so we both got to try them all. They certainly packed on the toppings. Because we still had a lot of work to do we didn’t get a chance to have a glass of wine, but we look forward to returning for dinner. The service was friendly and quick. RT’s is the classic neighborhood restaurant. It doesn’t look like much from outside. It’s on Mt Vernon Avenue just outside Del Ray. When you go inside, however, you are treated to an interesting menu of New Orleans style seafood dishes, and attentive service. One of my old time favorites is the shrimp Diane. The baked oysters and bar-b-que shrimp appetizers are stellar too. Susan had the crabcakes last time and ate both–most places she usually takes one of them home. There is a bar with televisions on the other side of the dining room. RT’s is a great choice before a show at the Birchmere, which is just down the street. This restaurant has been well thought of for a long time. Pho Bowl is a hidden gem in Alexandria’s Landsdowne Centre. A Vietnamese restaurant, Pho Bowl offers the delicious, traditional beef noodle soup called “pho” with a variety of different add-ins like meatballs, steak, brisket or chicken. Its perfect to warm you up on a chilly day or to have when you feel a cold coming on. This soup seems to have healing powers! Pho Bowl also has tasty grilled meats served with rice or vermicelli. The grilled beef with vermicelli is one of my favorite dishes, but the lemongrass chicken, pork and shrimp are excellent also. Johnny’s New York Style Pizzeria is located at the Festival at Manchester Lakes Shopping Center in Alexandria. Besides their fantastic pizzas, they have a huge menu that includes baked pastas, calzones, salads, subs, wraps, desserts, and MORE! Dine-in, grab a slice to go, or have your meal delivered. You don’t want to miss out on this local favorite! Cheesetique is a specialty wine and cheese shop in the Del Ray neighborhood of Alexandria. Their small front patio is perfect for people watching while enjoying a glass from a generous wine list paired with artisanal cheeses. The full menu, which includes small plates, soups, salads, cheese plates and sandwiches, is available to indoor and outdoor diners. For the bargain hunter, they offer daily happy hours, Thirsty Tuesdays when all bottles of wine are 20% off at dinner and Wine Down Wednesdays when all house red and whites are $5.00/glass! If you decide to purchase wine in their store, do not forget to check out the discount rack.